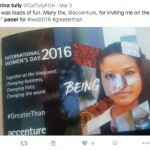 Cat was also invited to take questions as part of the Accenture ‘Changing Lives’ panel for International Women’s Day 2016. This week’s hot links include financing water, inequality, growth and global strategy. This week’s hot links include gender equality, development and hybrid warfare. This week’s hot links include gender development, innovation, brexit and the refugee crisis. This week’s hot links include: international aid, sustainable development goals and the United Nations youth forum.